We install all types of roller shutters for commercial and domestic use in Barnstaple throughout Devon. We offer standard and made to measure security roller shutters, supplied and installed by our qualified fitters. 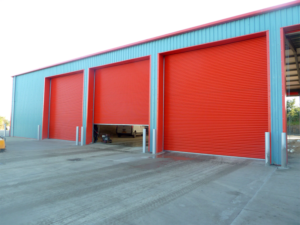 Having install 1000’s of security roller shutters across Devon and Barnstaple A and A Garage doors have become one of the leading commercial roller shutter contractors in the South West. As you might image the price of any reliable, insurance approved security roller shutter varies greatly from the size, operating mechanism, door features such as insulation and fireproofing will all contribute to the cost of a new security roller shutter. We offer a no obligation site survey to discuss what you need, review the existing opening and price up your security shutter – talk to us before you decide, call Barnstaple [te] today. More than happy with the awning which A & A Garage Doors fitted a few weeks ago. Cannot recommend them highly enough, efficient friendly service, with both engineers going that extra mile. Thank you A and A garage doors for a great job. I thought you were professional from start to finish. My new sectional doors are above and beyond what I could have imagined. A good company. The door was fitted efficiently and quickly. I am now the proud owner of a lovely new insulated roller shutter door. I would recommend them to friends and family. A&A Garage Doors Ltd are a registered member of the Door & Hardware Federation (DHF), who's aims are to raise standards in the building and industrial garage door market. Specifying from DHF members gives you peace of mind when searching for a new garage door supplier you can be assured of the quality of installation. In addition DHF offer value consumer advice on what and who to look for when choosing a new garage door for your home or business. © 2019 Copyright | A&A Garage Doors | All Rights Reserved.